all of New York is crawling in fear. you are notified via a PA system at a place called “The Happiest Place On Earth” that ” due to circumstances beyond our control, the Magic Kingdom is now closed. Please follow the direction of the nearest Cast Member.” However, there is not an impending hurricane. the FAA grounds all outgoing and incoming airplanes. thousands of people lose their lives by just going to work or leaving on a jet plane in Manhattan, Shanksville, PA, and Washington DC. 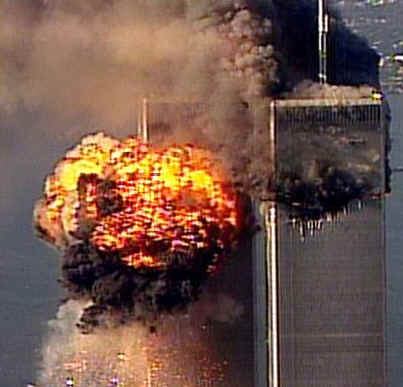 However, the twin towers ceased to exist as of September 11, 2001, which launced the United States into what has become known as the War on Terror. and the Pentagon were hit by commercial airliners in an attempt by the Taliban and Osama Bin Ladin to bring America to her knees and cry. This birthed the post 9-11 world, the world that we currently reside in. The plane that crashed in Shanksville, PA was headed for the White House. Once again, we have entered a pre-9/11 mindset. President Barack Obama has decided to shut down Gitmo and house the prisoners in Thomson, Ill. Also, a decision has been made by the Obama administration to try those accused of masterminding the 9/11 attacks in New York City which, in essence, gives them rights equivalent to a criminal in the US. To top it all off, the attacks at Ft. Hood have gone unavenged. If the Obama administration keeps this up, they will put us on the fast-track to another terrrorist attack. Former President Bill Clinton did nothing to retaliate against those who lost their lives on October 12, 2000 when the USS Cole was attacked by Taliban suicide bombers. Clinton also did nothing about the 1998 US Embassy bombings in Nairobi, Kenya. If we do nothing to evoke a harsher stance towards terrorism and keep the course in Afghanistan, we will indeed face another tragic day like September 11, 2001.